Get PreSonus' flagship DAW bundled with their top music notation software for an incredibly powerful composition duo. Work better, faster. 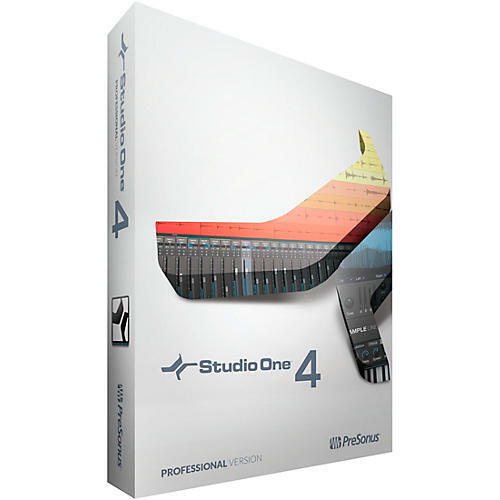 Studio One 4 Professional is designed for ease of use without sacrificing effectiveness. It seamlessly combines the time-tested recording studio model with today’s beat-oriented production process, so musicians of all genres can being their musical ideas to sonic reality—quickly and easily. Studio One doesn’t dictate a workflow, but provides the tools and flexibility for musicians to follow their own musical path. Songwriters prototyping a song will love the new Harmonic Editing features, which allow Instrument and Audio Tracks to follow chord progressions dynamically. For EDM and hip-hop producers, the next-generation Impact XT and Sample One XT virtual instruments are complete production environments—auto-slice, dice, sample, deconstruct, and trigger synched loops with an intuitive workflow. Patterns and a new Drum Editor bring step sequencing and drum machine-style music creation into the 21st century. Studio One is also a complete mastering suite, including DDP import/export for CD duplicators and digital delivery for online streaming and publishing. Bring musical inspirations to life with the blazingly fast and intuitive Notion 6 music composition and performance environment. Compose when and how you want and even enter music with your own handwriting. Take projects to the next level with deep integration with Studio One. Hear and perform music with gorgeous samples by the London Symphony Orchestra and others. Deliver polished scores faster than ever before, from complete film orchestrations to simple lead sheets and guitar tab. Notable improvements include: cross-platform handwriting recognition; new layout control and features for professional score output; drag to re-space measures and systems; new instruments from Soundiron; new video window controls for faster scoring to picture; the new Notion Scores library, with over 100 great works; updated Music XML support for seamless transfer with other apps; MP3 export; MIDI over ReWire for improved integration with leading digital audio workstations; and unprecedented side-by-side workflow integration with Studio One Artist or Professional on the same computer or between multiple computers on the same network.